With the new transformerless Powador 6.0 TL3 to 10.0 TL3 3-phase inverters, now even small roof systems can be realised with the most flexible line of 3-phase units on the market. With AC rated power of 5 kVA, 6,5 kVA, 7,5 kVA and 9 kVA they cover the range from the unbalanced load limit up to 10 kW. They operate using two separate MPP trackers that can handle both symmetrical and asymmetrical loads to allow for optimum adjustment. Each tracker is able to process all of the AC output. This allows for all typical requirements of complex designs to be fulfilled; on the one hand, for example, full configuration of an east/west-facing roof (symmetrical load) or, on the other hand, the regular configuration of a south-facing roof without having to dispense with the solar yield of a dormer (asymmetrical load). Two strings can be connected per MPP controller, i.e. 4 strings for each unit. The rated input voltage range is particularly broad. From 250 V the units switch to the mains and during operation they still feed in at 200 V. This means that solar yields are optimum for comparatively small areas such as dormers or carports but they also operate for more of the day. The peak efficiency is 98 % and the European efficiency is also above average. The compact design weighing 40 kg combined with the DC connection via solar connectors makes installation very easy and economical. Protection class IP65 ensures the greatest possible flexibility when selecting the installation location. It is easy to achieve perfect communication with these units. They are fitted with an integrated data logger with web server, a graphical display for showing operating data and a USB port for installing updates. The current software can be downloaded free of charge from the download area of www.kaconewenergy.com/en/service. The yield data can be called from the web server or via USB for evaluation. The integrated data logger can also be connected directly to the Powador web internet portal for professional evaluation and visualisation of the inverter data. A number of country-specific default settings are programmed into the inverters. These are easy to select during on-site installation. The interface language can be selected separately. 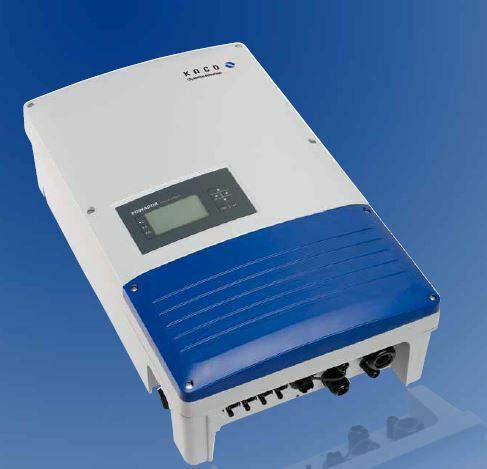 The inverters support the functions of the Powador-protect for grid and plant protection and also power management.